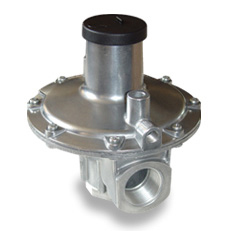 The J48 regulator is a compact, commercial and industrial low pressure regulator suitable for a wide range of pressure control applications, including such OEM equipment as boiler and burner trains for a variety of gases. Outlet pressures from 2" up to 64" W.C. are available, with a 5 PSIG maximum allowable inlet pressure. J48 Spares Kit, ½", ¾", 1"..
J48 Spares Kit, 1¼", 1½"..
J48 Spares Kit, 2½", 3"
Spring, 2-6", Dark Green / Light Bl..
Spring, 9-14", Dark Green / Brown..
Spring, 2-6", Black / Light Blue..
Spring, 5-10"/18-26", Black / Light..
Spring, 5-10", White / Dark Blue..
Spring, 9-14", White / Dark Green..